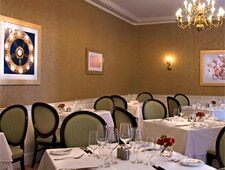 An elegant American restaurant located in the historic neighborhood of Old Town Alexandria. Breakfast & Dinner daily, Tea Sat., Brunch Sun. : An intimate space with its own cheery fireplace, full bar and gentlemen’s club ambience (but everyone is welcome), The Grille is the more casual dining room at the Morrison House. The menu satisfies on all counts: a small amuse-bouche with scallops ceviche in a lime cream may well inaugurate the meal, and a Champagne with sorbet palate cleanser might appear between courses. Dinner encompasses such entrées as a robust Virginia burger and perhaps roasted trout paired with Brussels sprouts and wild mushrooms on a bed of potato purée. Be sure to start with a Caesar salad, here transformed to a serving of grilled hearts of romaine with three large cubes-as-croutons filled with a Caesar dressing. Quite unique. Desserts? Consider the coconut cream pie with a piña colada foam.